SUPPORTERS OF ABORTION RIGHTS bristle at the term "partial-birth abortion," and sympathetic journalists often make a point of setting it off with scare quotes or injecting a phrase meant to dilute the term's grisly legitimacy -- for example, "a controversial procedure that critics call 'partial-birth abortion'" (as the Los Angeles Times has put it), or "a ban on so-called 'partial-birth' abortion" (to quote Reuters). But what happens to such fastidiousness when it comes to terms coined by liberals? Terms like "Fairness Doctrine" -- an Orwellian label for government stifling of untrammeled political speech over the airwaves. Or like "Employee Free Choice Act," a benign title for legislation that would deny employees the right to a secret ballot in workplace elections. Strange, isn't it, how the concern with terminological exactitude kicks in at the appearance of a freighted expression from the right, yet fades into the mist when the language comes from the left? THERE'LL ALWAYS BE an England, but will there be Englishmen to inhabit it? Not many, if Jonathon Porritt gets his way. The chairman of Britain's Sustainable Development Commission declares that "having more than two children is irresponsible" and that couples who "decide to procreate" should first consider their "total environmental footprint." According to the Sunday Times, Porritt wants the British government to "improve family planning, even if it means shifting money from curing illness to increasing contraception and abortion." Ending or preventing human life, in other words, should take precedence over extending or saving it. Such misanthropy is not unique. Greenpeace co-founder Paul Watson, now president of the Sea Shepherd Conservation Society, wants to "radically" reduce the world's human beings by five-sixths. Population alarmists Paul and Anne Ehrlich have described "the birth of an average American baby" as a "disaster." Alan Weisman's 2007 best-seller The World Without Us celebrates the Eden the world would revert to if only mankind would vanish. There is even a Voluntary Human Extinction Movement, which urges "people who care about life on planet Earth" to "refrain from further reproduction." Those on the green fringe do indeed care about life on Earth -- every kind of life, it sometimes seem, but one. WINTER DOESN'T OFFICIALLY END for another three weeks, but Daylight Savings Time arrives next Sunday, and with it the semiannual aggravation of resetting every clock and watch in our lives. (Don't forget the microwave! And the car dashboard!) Must we be saddled forever with this World War I-era relic? Contrary to popular belief, daylight savings doesn't reduce energy consumption, it increases it. And not everybody relishes late-evening daylight; plenty of people would rather see sunlight earlier in the morning. We can end this spring-forward-fall-back madness once and for all -- and we can do so without having to choose between daylight time and standard time. The solution is simply to split the difference: Let's amend the Uniform Time Act so that clocks would be shifted by 30 minutes -- then let's leave them that way for good. THIS IS A LOUSY TIME in the newspaper business, and it grew lousier last week with the folding of the Rocky Mountain News. 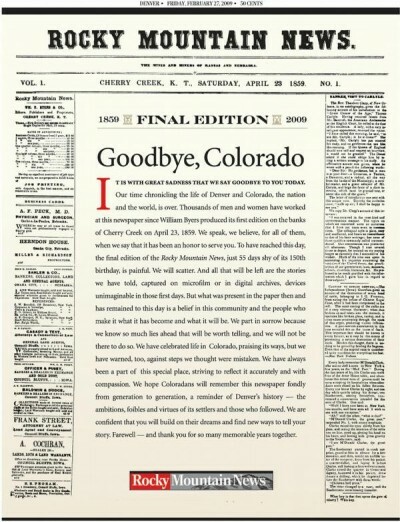 Colorado's oldest newspaper, just 55 days shy of its 150th birthday, published its last edition on Friday. "We've been clouted by a recession, an online revolution in publishing and advertising, and changing consumer tastes," the paper said in a final editorial. It lost $16 million last year, and its parent company, Scripps-Howard, could no longer absorb the losses. At least Denver will be left with a daily paper -- the Rocky's storied rival, the Denver Post. But if worse comes to worst in San Francisco, the City by the Bay could soon find itself with no newspaper at all. The Hearst Corp.'s San Francisco Chronicle is hemorrhaging red ink, and must find a way to slash costs. Otherwise, Hearst CEO Frank Bennack Jr. said on Tuesday, "We will have no choice but to quickly seek a buyer for the Chronicle, or . . . to shut the paper down." Over the years, newspapers have chronicled the rise, reign, and demise of countless institutions. Is it now our fate to write our own obituaries? For all their faults -- political correctness, a taste for sensationalism, deadline-pressure errors, "horse-race" political coverage -- solidly reported and edited newspapers are indispensable to the health of a democratic republic. Blogs and online forums will not take their place. "News stories do not sprout up like Jack's beanstalk on the Internet," the San Francisco Chronicle's Debra Saunders reminded her readers last week. "To produce news, you need professionals who understand the standards needed to research, report, and write on what happened. If newspapers die, reliable information dries up." Are environmentalists responsible for the Unabomber?